Last night, the new MJTI Interfaith Center in Beverly Hills hosted a seminar on the Gospels with special guest, Boaz Michael, the founder and director of First Fruits of Zion. The two-hour seminar introduced many of the typologies throughout Matthew to Yeshua’s “Moses-like” fulfillment. The Gospels are composed in a thoroughly Jewish manner and need to be understood within that context to fully see what and why things take place and are said. The Moses in Matthew seminars are currently being offered at various locations and if you have the opportunity to attend one of these seminars, definitely do it! For more information about the seminar and a list of upcoming dates and locations, click HERE. I found myself not only intellectually engaged and enlightened, but spiritually encouraged by this discussion. The seminar also provided an opportunity to promote the new Delitzsch Hebrew Gospels (DHE). Back in June I posted a review of the Delitzsch Hebrew Gospels here on this blog. As one of the participants on the translation review team I have been very excited about this project, specifically the contribution I believe it makes in further revealing the Gospels as Jewish texts – and which need to be read and understood as such. Although I have witnessed the project at various stages and already had a copy of the initial Standard Edition, last night was the first time I was able to finally see the three Deluxe Editions as well. Something must be said about the quality and scholarship of everything First Fruits of Zion/Vine of David does. The previous pictures I had seen did not even come close to representing how beautiful these editions turned out. The deluxe editions are beautifully laid-out and bound; and the leather covers are of the highest quality. The blue deluxe hard-cover edition is extremely beautiful, as is the brown leather soft-cover edition. And the special burgundy Levy Hirsch edition is also absolutely stunning. 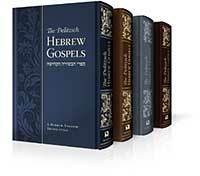 The DHE fulfills not only the rabbinic tradition of ‘beautifying a mitzvah,’ but presents the Gospels in a high quality and throughly Jewish way. Every book shelf should have a deluxe edition of the DHE. Thank you FFOZ and the Vine of David team who worked so hard on this project! You are truly helping to bring about redemption and hasten the return of our beloved Mashiach! This entry was posted in Uncategorized and tagged Bible, Delitzsch, FFOZ, Gospels, New Testament. Bookmark the permalink.